From three major cities (Brooklyn/Queens, Chicago and Los Angeles) Catholic and Buddhist leaders have come together to develop proposals to address homelessness by providing green affordable housing and services to the housing residents as well as persons coping with poverty in the neighborhood. 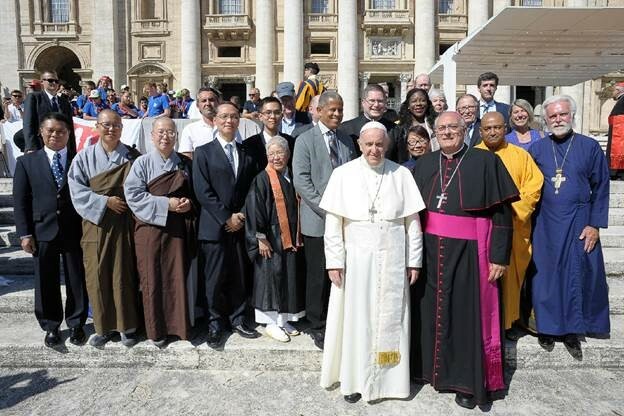 The initiative called the Buddhist-Catholic Dialogue of Fraternity had a meeting at the Vatican with the Pontifical Council for Interreligious Dialogue (PCID) in 2015. In addition to Buddhists and Catholics, the groups included affordable housing developers and advocates Mercy Housing and Enterprise, as well as service providers Catholic Charities and St. Vincent de Paul. On September 11-12, 2018 delegates representing Buddhist, Catholics and housing developers presented to the PCID and the Pope three proposals addressing affordable green housing. Amy Bayley RSM, Regional Vice President of Community Planning, represented Mercy Housing California, the developer in Los Angeles and Linda Werthman RSM, Chair of the national Mercy Housing Board was in the delegation representing a project from Mercy Housing in Chicago. On September 11th the delegation had a good conversation with Bishop Ayuso, Secretary of PCID. Although the planned private papal audience by the delegation was not possible due to the crisis in the United States institutional Church, the delegation’s work was recognized by the Pope at the audience and the delegation was able to meet with the Pope afterwards to present him with the proposals. The next steps are that the proposals go to the Vatican’s State Department who will advised the Pope and, if supported, the proposals will be forwarded to the Papal Foundation Board requesting gap financing to bring the proposals into reality.